Another invaluable publication by Glen Adams about Inland Northwest history. Man, the Ye Galleon catalog must be hundreds of items long! This one is actually a sort of scrapbook about events relating to the life of Kittitas (Upper Yakima) notable, Mary Moses a.k.a. San-clow, circa 1827-1939. She was a daughter of Chief Owhi and a sister of the warrior Qualchan. (Whose mortally wounded fellow fighter Kanasket taunted the US Army in Chinook Jargon.) Qualchan was summarily hanged by Colonel George Wright one day in September of 1858 south of what’s now Spokane, WA. 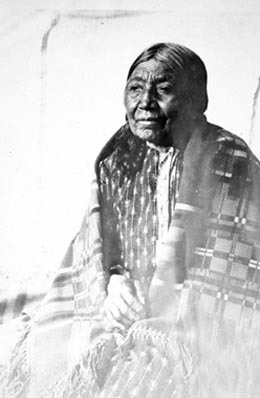 She was the wife of Columbia Salish Chief Moses, as in Moses Lake. An interpreter into Mary’s language was found nearby. A most fascinating reference to the French trader said to be responsible for originating a certain version of Chinook Wawa. Michel Laframboise references pop up regularly for his skills in language learning and interpretation coming out with Astor’s group and continuing with North West Co/Hudson Bay. Some suspect he played pivotal role. You are bringing up an interesting man indeed. George Lang discusses Michel Laframboise as potentially the only ‘white’ to learn the old Chinook tribal language.